How did eLearning come into being? Globalization is one of the factors that necessitated creation of online training solutions. Employees are located at different geographical locations and training them the traditional way is time consuming and costly. Added to this, business demands are constantly changing. Markets are expanding and there is a proliferation of products. Due to these reasons, it became imperative for employees to be constantly updated on their knowledge and skills. This means training has to be continual and ongoing. That is how eLearning came into picture. E-learning is the use of technology to enable people learn anywhere and anytime. E-learning is created taking into account adult learning principles, learning styles, and instructional design principles. E-learning is the use of technology to enable people to learn anywhere and anytime. Simply put, learning accomplished with the use of electronic media is eLearning. However, it is not as simple as it may seem. The information provided by subject-matter experts is made learner-friendly with the application of the principles of instructional and visual design and then produced using authoring tools/ software such as Articulate, Lectora, Captivate, Flash etc. Finally, it is made AICC or SCORM compliant and made available on the Learning Management System, Web Portal or intranet for users to access. The objective of an eLearning course is to teach or help individuals, who are essentially trying to learn by themselves. However, eLearning is NOT just adding audio to presentations or recording live sessions and uploading them on an LMS/the Internet/a website. While this is easy and incurs less cost, it provides very little to the learner. After all, it is a one-way communication without any consideration to learners and their needs. E-learning is created taking into account adult learning principles, learning styles and instructional design principles. In the case of adults, we need to facilitate rather than teach. We need to connect the current learning to what they already know, and we need to make the learning solve their problems. We have to bring in “What’s in it for me” very clearly. Therefore, when designing eLearning courses, these factors need to be kept in mind. To know more about adult learning principles check out this blog. People have different learning styles. Some learn better by reading, others by seeing and some others by hearing or doing hands-on activities. E-learning needs to address these varied styles of learning. This is done by carefully integrating text, audio, graphics and images, so that it has a balance of all stimuli that appeal to all learners. Finally, we have to apply sound INSTRUCTIONAL DESIGN PRINCIPLES to facilitate learning for adults. 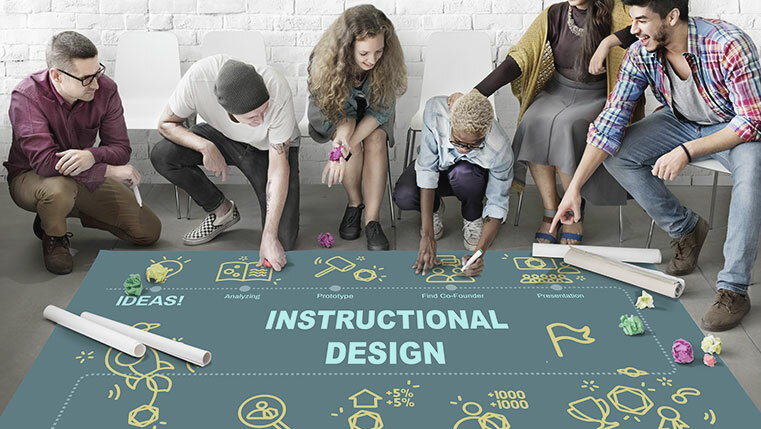 There are many models of instructional design we follow, depending on the audience profile and the subject at hand. The most popular and commonly used model is the ADDIE model. ADDIE is an acronym for Analysis, Design, Develop, Implement, and Evaluate. The model prescribes an audience and content analysis, then design the course by deciding on the instructional, visual and auditory strategy, develop the course with the appropriate authoring tools, implement the learning and finally evaluate it. The other model called the Gagne’s 9 step model is especially suitable for PROCESS training. Kirkpatrick’s model is used for evaluation of learning outcomes. There are many more models at the disposal of learning experts, and they need to choose the right one based on different situations. Thus, designing an e-learning course is an exacting process based on sound learning principles. It involves application of a number of principles and practices that is far more specialized than making a simple PowerPoint slide deck. This ensures that the course is effective, ensuring participants learn and apply what they learn to their jobs. Now, let’s see the different stages in eLearning design and development. The following diagram gives a bird’s eye view of the entire process. This is the first step of the eLearning development process. At this stage, you need to analyze the learning content, learning objectives and the profile of the target audience. You also need to take a look at the type of job or tasks that the participants are expected to accomplish after taking the course. Based on this, a broad instructional strategy is formulated to decide on the best way to present the content. Next, learning experts need to create a design document that incorporates the recommendations of the learning management team. Requirements of the stakeholders, training objectives, assessments required and design challenges are taken into account at this stage. This document also specifies the instructional, visual and audio elements to be included in the course curriculum. The specifications in the design document are executed by incorporating the content, visuals and assessments into a storyboard. The page layout, graphic user interface and multimedia elements are all finalized at this stage and incorporated into the course. There are a range of rapid authoring tools today such as Articulate Storyline, Lectora, Captivate, etc., which can be used for giving a definite shape to your eLearning course. Using rapid authoring tools expedites the course development process considerably thanks to their in-built interactivities and templates. Check out this online video that explains how to zero in on the right authoring tool for your eLearning course development. Next, is the evaluation stage where the quality of the developed course is tested to ensure accuracy of functionality as well as content. Editors, instructional designers, subject matter experts and quality control managers check various components of the course to ensure perfection. Feedback is incorporated into the course and uploaded. If a course needs to be translated into one or more languages, it is done at this stage by following a separate sequence of actions to ensure accuracy and quality. Finally, the course is hosted on the LMS or any other learning portal. The target audience is given the link, user information and passwords to access the course. Using an LMS allows managers to monitor and evaluate the training program at every stage – how many users have registered, how many have completed, how many have abandoned mid-way, etc. This helps in taking corrective action and ensuring maximum success of the training initiative. Communication is the key and one has to ensure that the courses are not just merely uploaded on to the LMS, but information about them is correctly and persuasively reached to the target audience. To summarize, a good eLearning course can be developed once you analyze your requirements and devise an effective learning strategy to share the knowledge required. You need to understand the components such as adult learning principles, learning styles and instructional design principles to create a course that meets your objectives. Finally, to develop the course you need to adopt a streamlined process and use the right tools to execute course development. The responsibility does not end here. Once the course is deployed, it needs to reach the target audience. For this purpose, you need to have a good communication strategy that ensures your intentions are understood, appreciated and accepted by everyone. Hope you find this article useful. Do share your views.